This mistitled book with a misleading photo on its cover has little to do with kamikaze. Two American sergeants, Miller and Krugar, participate in the infantry assault on a fictional Japanese-held Pacific island not far from Australia. This book does not have a publication date, but it most likely first came out in the late 1950s, and another publishing company republished it in 1980. The book depicts intense and bloody fighting between the Allies and Japanese on a small jungle island, but the author devotes little attention to development of the characters. The Allied soldiers frequently use racist terms to describe the Japanese (e.g., ape, monkey, yellow face, Jap, Nippo), much like actual anti-Japanese language used during the war. The chronology of events in this novel makes no sense. A few statements, such as the U.S. was still reeling from Pearl Harbor and the American Navy was ready for a strike at the Solomon Islands, indicate that the year must be 1942, but the author never gives specific dates anywhere in the book. However, some events mentioned in the novel occurred long after 1942. For example, a soldier mentioned he had a buddy at Iwo Jima (p. 69), even though this battle began in February 1945. Also, the Japanese Navy did not form the first kamikaze corps until October 1944, but this novel mentions a secret kamikaze air base on the jungle island. 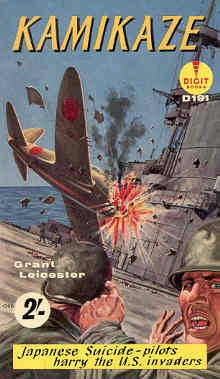 Despite the book's title, the limited references to kamikaze in the novel provide no help in understanding the nature of Japan's suicide attacks. The Japanese never had a kamikaze air base south of the Philippines, and the Japanese military did not actually resort to suicide attacks until late in the war in a desperate measure to stop the continuing advance of the Allies toward the Japanese home islands. The novel's four pages about kamikaze plane attacks describe antiaircraft fire against them, but American fighter planes scarcely appear in the novel even though in reality they destroyed many kamikaze planes. The author offers almost nothing to explain the reasons for the kamikaze attacks other than vague statements such as the following one, "Mad suicide attacks continued, and the Kamikaze died bravely, stupidly, against a slaughter of fire" (p. 149). Leave this paperback in the dustbin!